On 23rd Street, just South of Market, stands a gloomy Victorian castle with big doors opening to the street. It's the armory, housing the First Troop, Philadelphia City Cavalry (FTPCC). 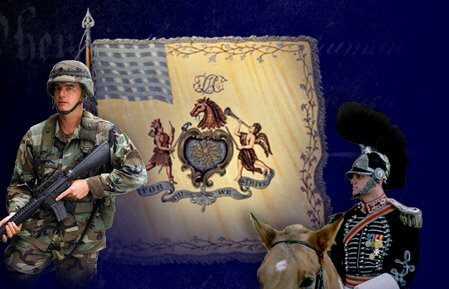 The organization is a real fighting unit of the Pennsylvania National Guard, participating with distinction in every war America has fought. Originally a horse cavalry, the unit now drives tanks, except for recreation and on ceremonial occasions. It lays claim to being the oldest military unit in America, although there have been several minor name changes since the days when the City Troop accompanied General Washington to take command of the troops in Boston. Their dress uniforms are pretty splashy, especially on horseback, and they have to pay for them, themselves. Furthermore, they are required to donate all of their military pay toward the upkeep of the unit and its activities. Although the first step in membership is to become a real member of the National Guard, election to the Troop itself is truly an election, carefully screened after prospective members have been observed and evaluated at invited Troop functions. These soldiers are wealthy, athletic, mostly pretty handsome, and almost invariably well-connected socially. You could almost make up the rest from these essential ingredients. This is the innermost core of Philadelphia society, and it is intensely and sincerely patriotic. Others have noticed that National Guard duty itself takes up many weekends and much of summer vacation. Add to that the many Troop dinners, the horsemanship activities, the debutante balls, the Chesapeake sailing cruises, the national and local ceremonies, the weddings and funerals for members -- and actually fighting wars overseas. The members of the Troop spend so much of their time on Troop-related activities, that they become both intensely loyal to each other, and necessarily somewhat withdrawn from other people. They gravitate to polo, the Racquet Club, the Savoy, the Orpheus, and the financial world. There may be an important insight into the generation turmoils to be derived from this. There was once a time when most professions likewise absorbed the lives of their members, with professional clubs and entertainments confining the social life of the member by leaving little time for anything else. But in recent years most occupational and professional societies are experiencing a loss of membership and enthusiasm, leading to the bewildered question of "Where are the younger members, any more?" The pre-fabricated answer is that younger people now want to devote their quality time to their families, but if you believe that, you will believe anything. Let's face it; when one activity absorbs all of your time, it confines you. There have to be some important benefits to being so confined, and even so it chafes a little. Those of us who are not baby boomers can see that being a slave to intra-generational consensus is only to be a slave in a different way. The remarkable thing is that the baby boomers fail to see it, themselves.